When I was at school, deep deep down, I wanted a badge. 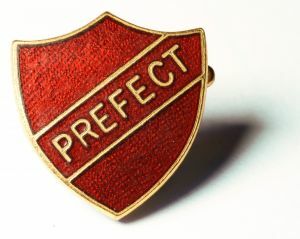 Many other girls had sports teams badges and there were badges for prefects and monitors. My one ascent to power was when I stood in as a deputy lavatory monitor but I was not given a badge. My temporary position gave me the power to eject loitering girls from the toilet area and report any incidences of cigarette possession to the Authorities. I was ready to betray every friendship in pursuit of a badge but no one offended and my chance slipped away. But now, at last I have a badge. I have become an editor. Thanks to Loveahappyending.com I have started to edit a regular feature on writerly topics. Smoking and loitering will be permitted. If anyone knows where I can get an official editor’s lapel badge, please please please Miss, I want one so much! Emma thinx: You never grow taller than the shadow of childhood. This entry was posted in authors, badges, editor, Emma Calin, loveahappyending.com, Romance Writing, school by emmacalin. Bookmark the permalink. I have a Canada lapel badge but I guess that likely wouldn't meet the mark. I like this new blog, badge or not. You could wear a blue pencil behind your ear! Congrats, Emma!! You are a fine writer who understands the need for a tough, demanding editor. That knowledge and attitude alone will make you a great editor.